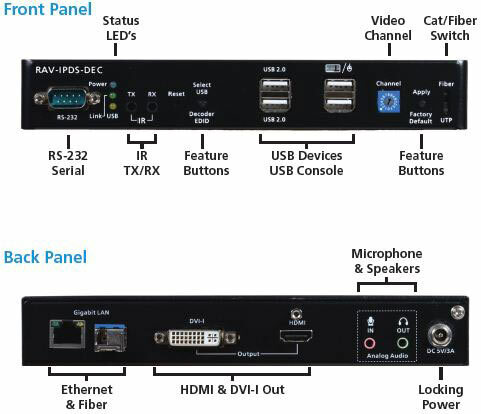 Raritan's RAV-IP is the most flexible AV-over-IP system with Cat5 and fiber connections for both AV and computer devices. 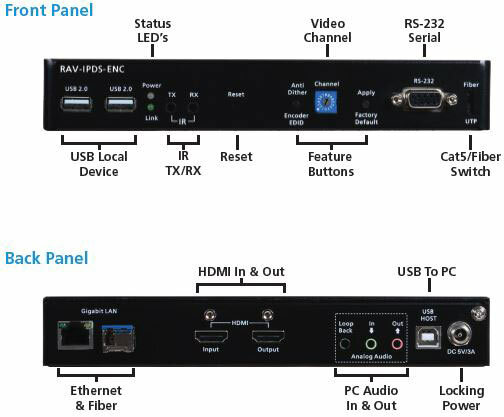 The RAV-IP sytem enables a wide range of applications through a few basic, yet powerful configurations: (1) Point-to-point extension to extend an AV device or computer to another location, (2) Single-channel video distribution to multiple destinations, and (3) Multi-channel switching of multiple video sources to multiple destinations. Raritan's AV-over-IP Distribution System provides economical, high performance video and audio streaming via HDMI video and audio, USB (including virtual media), Infrared (IR) and serial. The simple encoder and decoder based system can be installed in minutes using low cost Cat5/6 cable, fiber, and Gigabit Ethernet switches. This flexible system supports digital signage distribution, video walls, multi-casting, multi source switching, and multi monitor systems. Works as a networked Matrix KVM, or point-to-point AV / KVM Extender. High quality 3 frame latency with low bandwidth 1080P HDMI-over-IP (JPEG like compression). Supports both Cat5 up to 330ft (100 m) and fiber connections up to 6.2 miles (10 km). Simple Control Options - Switch channels via rotary dial or included remote control; AV devices via IR or serial; Computers via USB keyboard and mouse. Installs out of the box with minimal setup requirement. Easy to expand - just add additional encoders and decoders. Does not require an expensive A/V control system - Uses low cost non-proprietary Cat5/6 cable, fiber, and Ethernet switches. RAV-IP supports both low-cost Cat5/6 connections, as well as fiber for longer distances up to 10 kilometers. The system is unique in its flexible support for Cat5 and fiber in a single inexpensive system. Installation and Configuration Made Easy To install and configure RAV-IP, connect the encoders and decoders to your input and output devices, and then to a managed Gigabit Ethernet switch with Cat5/6 cabling or fiber. The system can then automatically set the IP addresses, or they can be assigned statically or via DHCP. A web-based GUI available for configuration. Use the channel switches on the encoder/decoders to assign video inputs to outputs. To switch channels, use the rotary switch or the included remote control, just like your TV remote control at home! A USB KVM control is also available. No expensive control systems or complex programming required. With RAV-IP you can stream 1080p video at up to 60 frames-per-second with low latency and minimum bandwidth. Supported video formats include: 1080p, 720p 3D, 1920x1200 (WUXGA) video. Supported audio formats include: LPCM, DTSTM & Dolby Audio Up to 7.1 channels. RAV-IP is perfect for many small and mid-sized applications like: Digital Signage and Video Distribution, Corporate Lobbies and Conference Rooms, Hospitality and Retail, Entertainment and Broadcast, Rental and Staging, Education, Houses of Worship, Control Rooms, Transportation and Energy.